One of the most scenic parks in Fairfax County is also among the most jeopardized and potentially dangerous. The park draws people because it is remote and beautiful, but some visitors take advantage of that to drink alcohol illegally and to leave the site trashed. Trash is a blight that ruins the next visitor’s park experience and that eventually floats downstream in the Potomac River into the Chesapeake Bay, causing pollution and impacting wildlife. The wrapper you drop in the woods can choke a turtle or a fish downstream. Scott’s Run is blessed and cursed by beautiful sections of stream that invite people to wade or swim, but wading and swimming in the stream is illegal, unsafe and irresponsible. Scott’s Run starts in one of the highest spots in Fairfax County, under the towering buildings of Tysons, and it flows into the Potomac River in an area called The Potomac Gorge. The Gorge is special, probably more special than most folks in the Washington area realize. The park’s terrain and the Potomac River’s floodwaters that transport seed from the Shenandoah Mountains are a combination that has created one of the rarest biological ecosystems in the mid-Atlantic. There are floodplains, rocky cliffs, and narrow valleys that were carved over eons by the erosive forces of the Potomac River. It is a union of rocks and river that is home to many unusual plants and animals. Because Scott’s Run is a nature preserve, the park’s entire area and all its resources are protected, including the creeks and streams. Wading and swimming are not allowed for a couple of reasons. First, the water can be polluted by runoff from upstream. Second, wading and swimming damage the fragile composition of the stream bed and possibly harm the area’s unusual combinations of plants and animals. In addition, the beauty of the gorge’s carved valley is deceptively dangerous. Water’s thunderous power is obvious at one of the gorge’s feature attractions, the cascades and falls at Great Falls National Park. But that’s not the only place along the Potomac River that the gorge creates quick, threatening currents speckled with underwater hazards. The large creek flowing through the western end of Scott’s Run Nature Preserve is surrounded by steep hills. When there is rain, water falling on the roads and rooftops of Tysons flows not into the ground but rushes over those impermeable surfaces into Scott’s Run. By the time the creek reaches the park, it has swollen into a massive amount of water. At the preserve, the steep hills act like a funnel. Combine the swelling waters from upstream with the water rushing down the steep slopes of the park into the narrow canyons of the creek, and water levels can leap upwards in just moments. Those quiet waters become a raging maelstrom that can knock over a human and drag him underwater into twisting, treacherous currents. People can die in these waters. That’s why swimming and wading are prohibited. Swimmers at Scott’s Run are in danger if waters rise. Waders are exposed to water that could be polluted, and waders kick up stones that provide shelter and housing for tiny animals. Yet the perception of Scott’s Run as a safe swimming hole persists, fueled by social media posts of people on rocks around the creek and near its low waterfall. 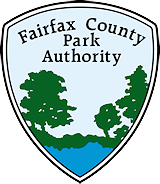 Fairfax County Park Authority regulation 1.21 states that swimming, bathing, and wading are prohibited in parkland bodies of water. The Fairfax County Police Department is going to enforce those rules this summer. The Fairfax County Fire and Rescue Department website says nearly three out of four times that the department responds to a river emergency something has happened along the shoreline, not in or near a boat. There have been rescues of people trapped by high water in Scott’s Run. Scott’s Run Nature Preserve is one of the most beautiful, alluring, remarkable parks of the Fairfax County Park Authority. Visit the park, take care of it, and enjoy this special place responsibly. And arrive safe and sound at home after you visit. Author John Callow is the Manager of Riverbend Park, which sits a short distance upstream from Scott’s Run Nature Preserve. Co-author David Ochs is the Manager of Stewardship Communications for the Park Authority. This entry was posted in Uncategorized on May 31, 2017 by Fairfax County Park Authority.